Easy to use tool for online adding text to photo's, images and animated gifs. Enter text, place it on the right position on your image, and off you go... With animated images, your image will stay animated! Text will appear after typing. Drag text to desired position. 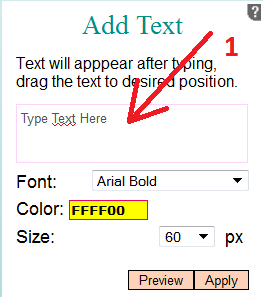 Type the text you want to add to your image in the Text field(1). Click the "Preview" button(2) on the toolbar to see the text appear in the editor screen(3). You can Drag & Drop the text to the right position on your image. 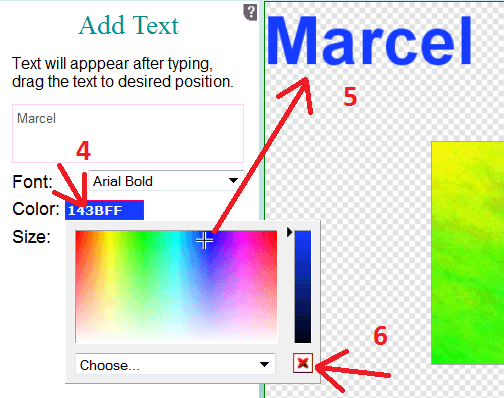 To change the color of the text, click in the coloured box(4). A colour picker will appear where you can select a colour. When selecting a colour, the preview text will immediately change(5). To close the colour picker, press the red cross on the lower right corner(6). 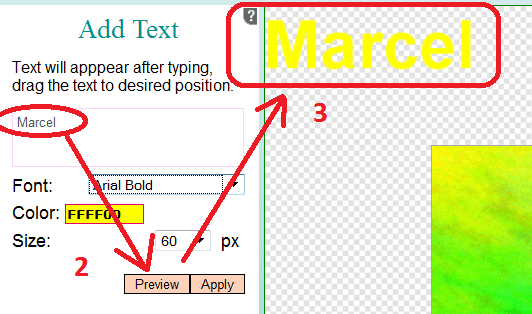 After positioning the text on your image you can change the Font(7), the Color(8) and the Fontsize(9) by selecting them from the drop down boxes. When you are satisfied with the position of the text, you can click the "Apply" button(10) to add the text to your image. Or preview all the fonts at once. The big advantage of this Online Image Editor is that you can also put text on animated gifs! It works just as described above. Type text, place it on your animated gif and press "Apply"!